Over the past year I have been hankering to go abroad again. Not just to travel, but to absorb a culture, to live and breathe in the aromas and surround myself with the wonderful sounds and bright colors. And as I’ve pondered this idea, I’ve been thinking about my third act of this short life. And, happily, I’m thinking it may be similar to my first act. After graduate school I went to Costa Rica seeking work in sustainable development. I had no leads, no predetermined path, just suggestions from friends in the development world that Costa Rica had lots of opportunities for a young, excited do-gooder. I went. Traveled much of the country exploring. I ended up in Monteverde, a stunning locale with hundreds of animal species just asking you to see them. But there just wasn’t any work to be had. Plus… I needed to learn Spanish. So off I went to Guatemala, where everyone suggested I go to get the best Spanish education. It was there that I found my place. The country is exquisite. Thirteen different climate zones, 26 different language dialects. The colors, the smells, the terrain, the people so warm. It was perfect. I stayed for four years. I ended up starting two ecotourism companies and consulting for Conservation International. I had an adventure nearly every day. Fast-forward…here I am, after nearly 11 years back in the USA, I have two wonderful cats, I’m a lover of writing and photography, a certified teacher without a teaching job, and no other satisfying career. Sound like a good time to try something new? YES! I am ready to fill myself up on the beauty of other cultures and have a bit of adventure again. But where to go? Now that I am obsessed with the idea, I have been asking myself the details… Where can I go that will resurrect my Spanish skills, offering me a good-steady- exciting-well-paying job, some place I haven’t lived before and doesn’t have an animal quarantine (I can’t leave my two babies behind! ), isn’t too far away so that airfare to come back and visit family and friends isn’t too burdensome etc. So I am excited to say, I’ve landed on our neighbor to the south – MEXICO! And now that I have a focus for my obsession, I have started gathering reading material that is giving me all sorts of fun insights into this beautiful country. 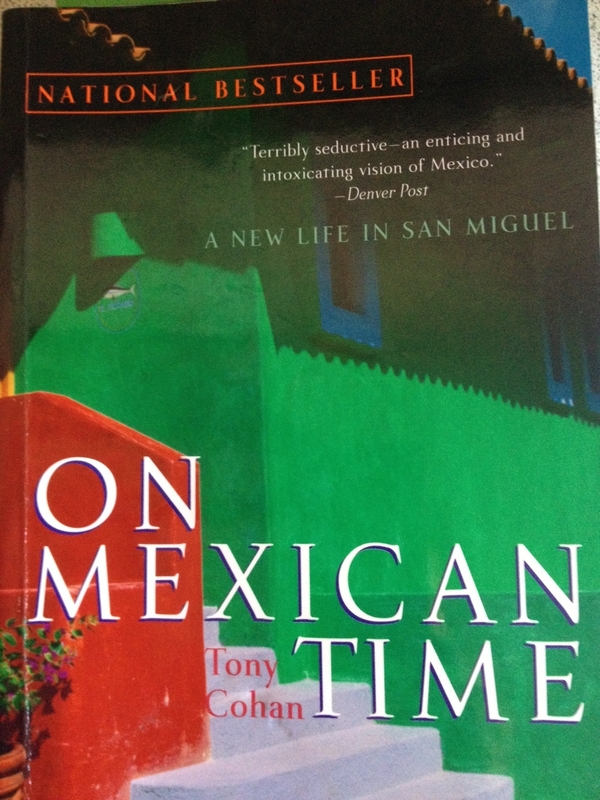 My latest find, by Tony Cohan: “On Mexican Time” has a similar theme to “Under the Tuscan Sun”, but his story is a recount of him and his wife’s exodus from L.A. in 1985 to discover the colonial town of San Miguel de Allende. I’m half way through and it is a fantastic, easy and fun read. Loving it. So a bit of a long story to tell you that I am now looking for teaching positions in International schools, figuring out the logistics and planning my escape, or rather, my third act, that is destined to be full of adventure, warm days, bright colors and with a bit of luck, love.